John Carroll borrowed the Willys this month for a feature he’s helping with in Land Rover Owner International Magazine and Practical Classics. 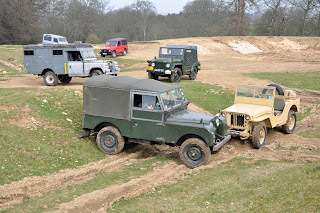 The feature will pitch 4x4s from three different decades together and, naturally, the Jeep was compared with a Series 1 Land Rover. Interesting how the Land Rover dwarfs the Jeep, but it is a later Series 1, not an original 80 inch. 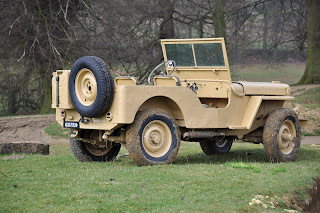 The Land Rover that owed so much to the Jeep in design. John pitched up here the evening before and we went and enjoyed an hour of pure Jeep talk over a couple of pints of Timothy Taylor’s Landlord bitter. Early the next morning he was off. 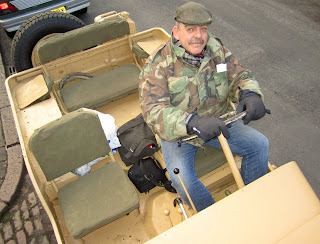 We put the screen up, but there is no roof so John wrapped up warm for his 100 mile round trip to Peterborough and back. Thanks to John for the location pictures and for wearing the right outfit for my photo. I can't imagine your response to someone walking up to you and Grumps, and asking "Can I borrow your Willys?"